Incorporating automated GUI testing for your Qt applications has never been easier with Squish for Qt, a tool which enables you to automate the tests of your application on any desktop, mobile and embedded system without the need to modify the application. Squish for Qt has dedicated support for GUI test automation of all Qt widgets, QML and Qt Quick controls as well as embedded Qt Webkit and Qt WebEngine content. Find out more about Squish for Qt by visiting us at Booth 21 and by attending our technical presentation, Let Automated GUI Testing Drive Your Qt Development given on December 6th. 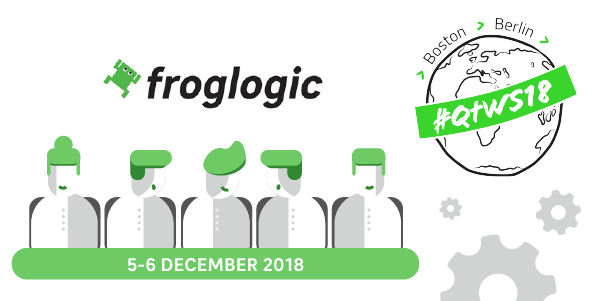 froglogic has a limited number of discounted tickets to the Berlin summit. To purchase a discounted ticket, schedule a meeting with a froglogic representative, or if you have any other questions, please contact sales@froglogic.com.